Finally, the commencement of Packers training camp is less than a week away. New names and also familiar faces will put on green and gold as Pack Nation pours into Ray Nitschke Field July 28th. There is a great deal of buzz surrounding this year’s draft class, however there is a lot to talk about involving the impressive class of 2016. Some will be battling for starting gigs while others are just trying to keep their name above a locker. Regardless of their impact to the team or position, each second year player will strive to avoid a sophomore slump that inevitably leads to a change in scenery down the road. Each player on this list would love to hold off staggered play in 2017. Allison, Martinez, and Brice may face more pressure to heighten their play so the Packers can take a sizable step forward. Kenny Clark sticks out as one of the more promising young players on the roster. 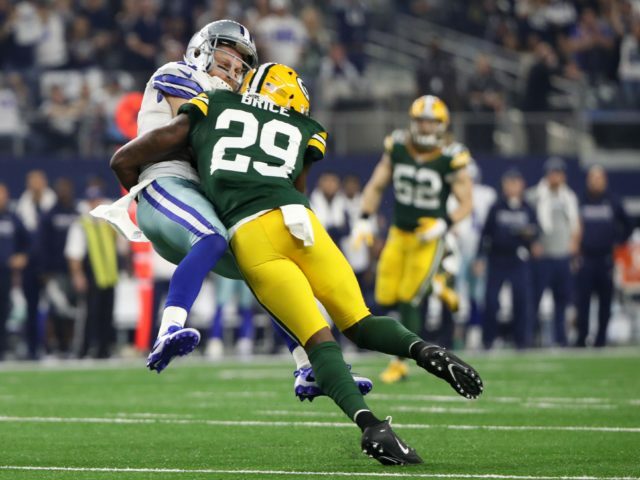 The former first round draft pick lost a lot of thunder to fellow rookie Blake Martinez as he went on to start in the very first game of 2016 at inside linebacker. The immediate impact of Martinez overshadowed Clark’s presumed assurance that the defense was headed in the right direction. Clark was expected to be the day one starter who could light a fire under the Packers’ front seven. He flopped in his attempt as went on to start in only 2 of 16 games. His 21 tackles went seemingly unnoticed as he struggled to steal reps from the aging Letroy Guion. Offensively, Jason Spriggs’ seat is a tad hotter than the other players listed above. He left a lot to be desired in his rookie campaign after earning a 47.6 blocker rating from PFF. Spriggs received initial praise for his athleticism, yet it has failed to translate to the NFL. During his limited snaps he was regularly bullied off the ball. According to reports, Spriggs has put on a lean 20 pounds that sits well with his 6’6” frame. Originally listed as a tackle, the Packers have an opening at right guard. If he desires playing time, then Spriggs could try to make the transition. That is if he can beat out newbie Jahri Evans who will turn 34 in August. Nonetheless, a bulkier Spriggs should be better adapted and more physically capable in 2017. Everyone’s anticipation will continue to grow leading up to Friday and the first whistle is blown. The importance of each second year’s role will not be swept under the rug, though Clark and Spriggs are likely a little more restless. Brandon Carwile was a Cheesehead at birth. His dad grew up attending games at Lambeau and passed on the legacy. Brandon graduated from Longwood University in 2016 with a degree in mass media. He has covered the Packers for over two years and currently works with packerstalk.com. Find him on twitter at @PackerScribe. Can the Rodgers-Adams Connection Get Stronger in 2019? This entry was posted in Brandon Carwile and tagged Blake Martinez, Dean Lowry, geronimo allison, Jason Spriggs, Kenny Clark, Kentrell Brice, Kyle Murphy, Kyler Fackrell, Packers 2017 Training Camp, ROokies, Second Year Players, Trevor Davis. Bookmark the permalink. My point I would dispute is moving Spriggs to guard. I would think that is a last case scenario. He was drafted to be a tackle in the future, a hedge against any injury to either of the two starting tackles or hopefully outplaying Bugula in camp. The Packers didn’t move up in the 2nd round (trading away one of TT’s precious draft picks) to have a swing offensive lineman, they expect him to start at tackle in the near future. Spriggs does not have the lower body girth to be a guard. He is a dancing bear (left tackle). Murphy is more suited than Spriggs to playing guard. Not sure what the author of this article “didn’t see in Spriggs”. Dude is a MONSTER talent, and the quotes about him being bullied were ridiculous! All I saw was solid effort every time he was forced into a game. All I can think is he was confused, watching Don Barclay, and thinking it was Spriggs. Spriggs shows HUGE talent. I suspect that the next time Bryan Bulaga is injured, will be the last time Bryan Bulaga starts in GB. If he’s pigeon holed as a left tackle, he may never play, as Bak is a rock. The numbers don’t lie. Nor does the tape, sir. What numbers, and specifically what tape? I watched the dude, every snap, every replay! The dude was crushing people!! Even at Guard the play increased as soon as they got the real liability out the game, “Don Barclay”. This is fake news make believe contrived stuff, the dude played really well, anyone who can’t see that doesn’t know FB..
Sure they were, have a look at what Pro Football Focus say’s about their process: We’ll start with the offensive line, where we are taking a purely grades-based approach. We came up with a multi-year grade based off “snap counts” and performance. Unknown quantities – like rookies or new starters – were assigned a “slightly below-average number”. So in other words, lick your finger, stick in in the air, and uuuumm yaaaaa, I know that much about him, lets rate him “below average”. Dude, please…. The only people whose grades really count for offensive lineman, are the organizations. The play picked up every time he replaced Barclay. That is exactly what I saw, and he totally held his own when inserted in any game! A. There’s a reason he had to get stronger and put on weight. He couldn’t hold his ground. B. No one is more atrocious than Barclay so that is just silly. The fact that they go to Barclay before Spriggs is all you need to know 😂. Dude, what first year OL/DL doesn’t work to put on the right mass? You and the author act like he was a *-ing rag doll, and you simply don’t have FB eye’s. Go ahead, live in some critic media hate world. I know potential, I know talent when I see it, dude has “IT”. Some people couldn’t see “IT” if it hit them between the eyes like a baseball bat. You just couldn’t stand the Logic could you, or being told how silly you stats were, so you had to put your cute little let me show you the door, please leave so I can be the king icon! Whatever! Sorry, not every media member is correct in accessing football talent, and they grind out poorly thought out assessments like hamburger, every day! In this case it’s based on poorly researched facts and fairy tales. I am the author and the point of the article is him needing to make the most of his snaps. Particularly in preseason. If the Packers thought they could get away with Spriggs then they wouldn’t have signed Bakhtiari to the deal they did. Have some humble pie because aren’t some football sorcerer. Or maybe you can let me borrow the elite goggles you watch every game with. Dude, again, it’s not about Left Tackle, it’s about depth, and probably more accurately, Tackle in general! Bakhtiari was a guy the Packers wanted to keep! The weak cog in the equation is Bryan Bulaga and his general health! He’s one more injury from being out the NFL. If we lose a tackle, we have a stud backup. Again, in what Universe does a 2nd round OL talent come into the NFL perfectly ready? The answer is really so few. The first round guys aren’t ready in many cases! He doesn’t need to prove ANYTHING he hasn’t already proven! There is no humble pie here you overly sensitive media head! Quit pumping out fake news and creating scenarios that are non-existent, and go find something positive to write about! Or better yet, go find something other than offense line ratings from a rag that doesn’t know anything about the player, and assigns him a below average grade because he’s a rookie? Thats your study here? You didn’t know that, you leaned on a football publication with zero backing, and that hurts. I get it! It’s tough to be challenged for birthing a steaming pile and being challenged on it! You’re probably even being paid which is more embarrassing really! Take your lumps and get better, and for Gosh sake do some research, this is embarrassing really. Bulaga was one of the best RT in the NFL last year. Between Bulala and Bakhitieri they have one of the best tackle combos in the NFL. I’m just fine with Bulaga holding down the RT spot as long as he plays like last season. Bingo. Bulaga had his best year as a pro. He and Bakhti have their jobs surely intact. Spriggs is a tackle. Period. Bulaga will be gone after this year. Frackrell would be my first choice on the list of a player that needs to avoid a slump. He didn’t play enough in 2016 to really “Slump” in 2017, but they need him to take a HUGE leap IMO. Someone has to take all the snaps that Peppers and Jones played at OLB. With the lack of depth on the roster right now Frackrell needs to make that huge leap forward. I loved the Frackrell pick when they took him. I’m hoping he can keep the 10 pounds he added contribute this year. I think it will be vital to the defenses overall success. Really anyone playing defense needs to take a leap. If every defensive player on that list is better the Packers defense takes a big leap. If all the 2nd year players AND Randall and Rollins improve the Packers have a top 10 defense which will be more than enough.